Fort Lauderdale’s premiere charitable wine and food experience! For over two decades, guests have strolled the famous Las Olas Boulevard in April for one special evening of charitable fun as the American Lung Association (ALA) hosts one of the premiere wine and food festivals of South Florida – and it’s back again! 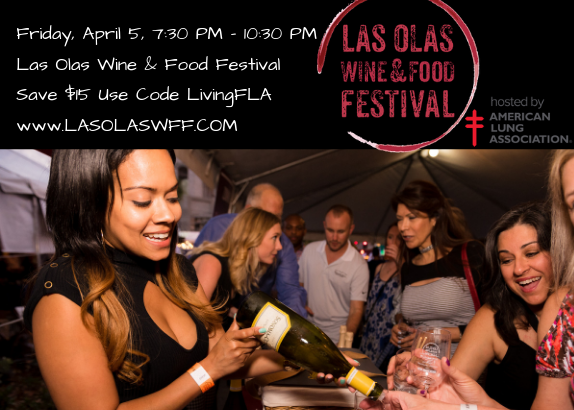 Get ready to indulge in the best eateries of Greater Fort Lauderdale and its surrounding areas paired with samplings from international wineries at the 24th Annual Las Olas Wine and Food Festival, happening Friday, April 5, 2019 from 7:30-10:30 PM. Presented by New Amsterdam Vodka, Fleur de Mer, J Vineyards, Woodford Reserve and Breakthru Beverage, our 2019 wine and food festival will entertain thousands of foodies with 50+ selected restaurants highlighting the best of Greater Fort Lauderdale, over 30 international wineries showcasing 200+ wines, live music, DJ’s, dancing, and incredible interactive experiences fit for our VIP guests. Best of all, the entire evening works to fight against the third leading cause of death in the United States, Lung Cancer with 100% of proceeds benefiting ALA South Florida. When throwing the best Florida festivals, planning is everything! Committee chair, Katie Leibick, Director of Event Management at Breakthru Beverage, is back again along with her new co-chair, Ina Lee of Travel Host, who are both ready to top last year with even more new and exciting elements for guests to enjoy. With ALL ticket holders enjoying VIP access, simply flashing #LOWFF’s signature wine-holder-necklace credentials gains them access into the VIP Lounges placed along each intersection PLUS all luxury tasting pavilions decadently designed on each Las Olas block. Wine and food tasting “Neighborhood Pavilions” will transport guests through the best of Greater Fort Lauderdale’s communities as guests experience the very best of our restaurants along with pairing wines. Tickets are available for $150 and are 100% all-inclusive. Special discount promotions are available throughout the upcoming months, so it is suggested to purchase early before specials (and tickets) run out. Additionally, this year’s Las Olas Wine and Food Festival is hosted by Las Olas Association, Las Olas Company, Amerant Bank, Celebrity Cruises, and Cadillac, so guests should get ready to sip, sample, mix, mingle, and CELEBRATE throughout our five blocks of fun! Support of this event will assist in funding research and educational programming for the ALA. Join us on Friday, April 5th as we provide a “breath of fresh air” for the culinary inclined. Our incredible list of 2019 participating restaurants will continue to grow as the event nears! Guests must have festival credentials to enter complimentary tasting pavilions. Taste 200+ Wines And Spirits From Around The World! Thanks To Breakthru Beverage And Their Supplier Partners, Presenting Brands Include Fleur De Mer, J Vineyards, Woodford Reserve, New Amsterdam Vodka. And Of Course, All Tastings Are Included In Your Ticket! Tickets can be purchased online at www.lasolaswff.com. For a complete line-up of events and ticket information, visit www.lasolaswff.com or call (954) 727-0907. Be sure to find us on social media for specials and giveaways at @LasOlasWFF.